Pears are in season from late summer into the winter, depending on the variety of pear. The most common variety is the Bartlett pear, which is in season during the late summer months. Look for Bosc and Comice pears in the fall and Anjou pears in the winter. Stock up on your favorites when they're in season. With a few simple steps, they are relatively easy to freeze and store, so they can be enjoyed throughout the year. Before freezing your pears, you need to make some decisions. What type of pears are using, what are using them for, and what freezing method will you use for storage? Follow these steps to help you decide. Start with firm, ripe fruit: If you just picked your pears, they probably aren't ready for the freezer yet. Pears need to ripen off of the tree, and it's a process that usually takes a few weeks. First, store your pears until they are perfectly ripened. Then, learn how to freeze your pears when they're ready. Wash, peel, core, and stem the pears: Then, cut them up into halves, quarters, slices—whatever you prefer. Keep them from browning: Add either 3/4 teaspoon of ascorbic acid, 1/4 teaspoon citric acid, 3 tablespoons lemon juice, 1/2 tablespoon salt or Ball's Fruit Fresh (in the amount specified on the label) to 1 quart of water, and soak the pears in the solution for a couple of minutes. 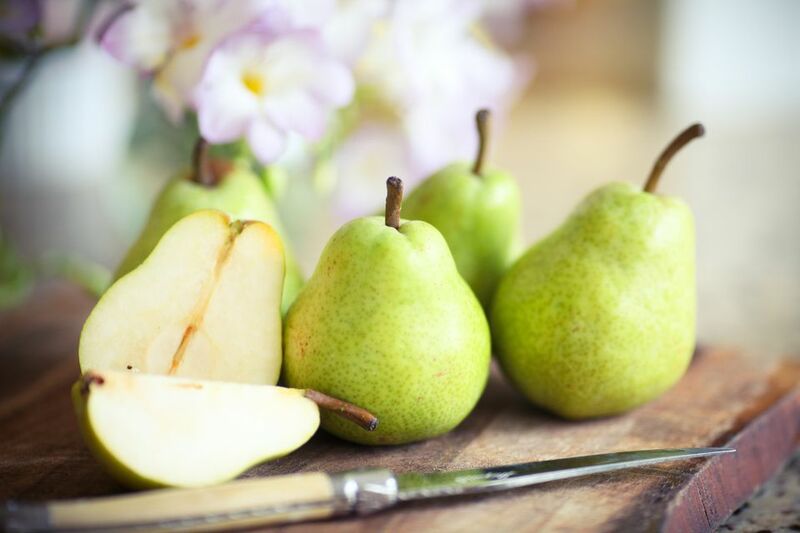 Choose your preservation method: Preserving your pears in syrup will result in the best color and texture, but you can also freeze them in sugar, juice, water, or nothing at all. If you're planning to use them uncooked, consider syrup or juice. Storing them dry or in sugar is the best method for pies or other cooked dishes. If you're planning to use them in a sweetened jam, jelly, fruit butter, or sauce, try water or unsweetened juice. A 40 percent syrup (medium syrup) is recommended for pears. To create your syrup, dissolve three cups of sugar in four cups of lukewarm water. This will give you a little more than 5 cups of syrup, or enough for 8-11 pints of pears. Each pint will use between 1/2 and 2/3 of a cup of syrup. Double, triple, or quadruple this amount to meet your needs. Once the syrup is prepared, bring it to a boil on the stove. Then, add the pears and blanch them for 2 minutes. Let cool, then pack the pears in wide-mouthed freezer jars or other freezer-safe containers. Fill the empty space with your syrup. Leave 1/2 inch of headspace in each pint or 1 inch of headspace in each quart. To ensure the pears stay submerged, stick a piece of crumbled up wax paper at the top of each jar before sealing and freezing. Sprinkle the pears with sugar. How much you use is a matter of personal preference, but 1/2 cup per quart is typical. Allow the pears to sit for 10-15 minutes or until the sugar has dissolved and a syrup has formed. Then, pack the pears in jars, leaving the appropriate headspace, and freeze. Blanch pears in fruit juice (apple or white grape) or water for 2 minutes. Let cool. Then, pack the pears in jars or other freezer-safe containers and fill in the empty space with the juice or water, being sure to leave the proper headspace. Use a piece of crumbled up wax paper to keep the pears submerged. Then, seal and freeze. Place pear slices on a cookie sheet, and flash freeze. Then, transfer the pears to freezer bags. Regular-mouth jars are not recommended for freezing. Stick to freezer-safe jars. They have thicker walls to prevent them from cracking when frozen. Save time when preparing pies and cobblers by freezing pears in the pie plate or dish that you plan to use. You even can add your spices before freezing. Then, transfer the pears to freezer bags once they're frozen. To use: simply drop your pears into a pie crust (there's no need to thaw them) and continue with your recipe. Expect slightly longer baking times when using frozen fruit. What Is the Right Way to Freeze Spaghetti Squash? How Do You Freeze Cabbage? How Do You Package Meat to Avoid Freezer Burn? Can You Freeze Pizza Dough?